Laser viewing windows allow you to see into the laser environment whilst preventing any damaging laser radiation from escaping out. TLM Laser are UK and Ireland distributors of one of the world’s leading laser protection specialists, Univet, and offer their complete range of glass and plastic windows – at highly competitive prices. Univet products comply to the very latest EN207 and EN208 regulations and combine technological innovation with manufacturing quality and above-spec protection. The laser windows range covers a wide parameter of wavelength and protection levels for the majority of industrial laser machines. The windows are made of the same base materials as Univet’s renowned eyewear. The glass windows have high absorption capacity and good visible light transmission; plastic versions are ultra-light and impact resistant but with a lower optical density. 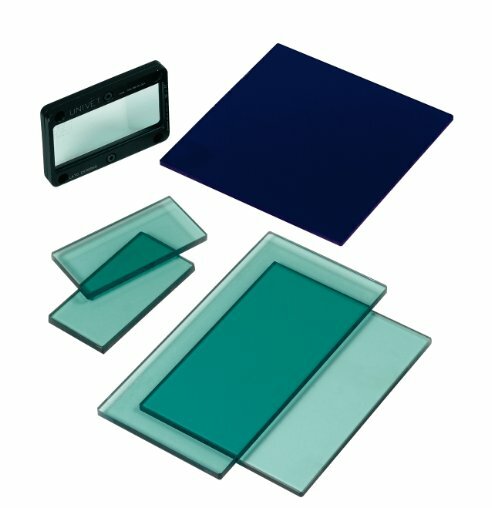 Univet Laser Windows provide a wide range of filters and protection levels for continuous wave operation, Q switched operation 109 - 107S and pulsed operation and optical densities. For full details, download the Laser Eyewear Catalogue in the Laser Safety section of our website. Available sizes in glass range from A4 up to 200x300mm; in plastic, from A4 to 914x1219mm. Custom sizes are available on request. For Laser Window prices, call TLM Laser on +44 (0) 1527 959 099 or contact us by email to sales@TLM-laser.com . We are confident you won’t find prices lower. With a Laser Window range that carries the Univet name, you’ll be hard pushed to find better quality and protection too.